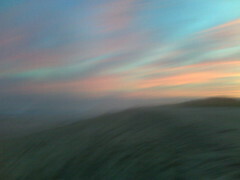 I took this photo with my Blackberry Curve last night on the beach at Sunset. I was moving too fast and it came out blurry. There’s nothing quite like the beach at sunset.